Gary Shuttleworth treated me for a “frozen shoulder” condition. He was knowledgeable, kind and understanding through each painful session, and I am so pleased with my great results. I will definitely return to Panther PT should I need help in the future. Thank you very much. I had a knee replacement in December. For PT I chose Panther Wexford office. Reason was Gene Filiaggi. Gene has helped me through many painful health problems. Panther is lucky to have him on staff. Also Kelly Patalsky the clinic manager is top rate. 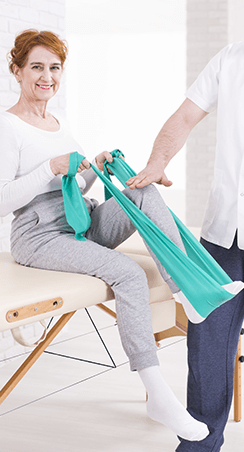 Panther Physical Therapy serves three convenient locations in Zelienople/ Harmony, Allison Park, and Wexford, PA. Our physical therapists take pride in providing the very best in physical therapy services. Many of our physical therapist staff have been with our company from its earliest days – a testimony to our commitment to our patients and to each other. Panther Physical Therapy shares a passion for delivering exceptional clinical results in a compassionate and respectful environment. Our physical therapist team members take pride in fostering relationships and creating partnerships within our community. Manual therapy at Panther Physical Therapy is our hands-on treatment by qualified therapist designed to help you function better. The McKenzie Method uses directional exercises & postural techniques to help facilitate rapid recovery. The hands-on approach used in the Mulligan Technique is intended to increase and maintain movement and physical performance. Trigger point therapy, often referred to as myofascial release, involves the application of gentle yet firm pressure to specific areas along the body.